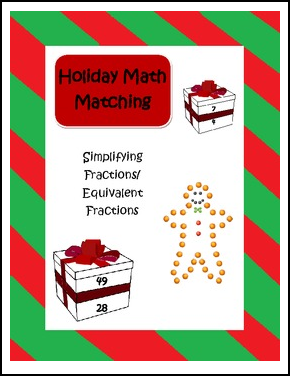 Use these holiday themed cards to enrich student learning and understanding of equivalent fractions and simplifying fractions. Simply cut out the cards, mix them up, and then students can simplify the big gift box and find the matching simplified small gift box. This can also be used to help students match equivalent fractions. These can be used to introduce adding and subtracting fractions in 5th grade, or used in 4th grade instruction. There are 6 pairs, 12 cards total. Fun practice! I hope you enjoy this freebie. Be sure to follow my store for freebie updates and new products! I have classroom decorations, writing prompts, sub binders, reading binders, reading prompts, border clip art, common core posters, word wall cards, and much more.